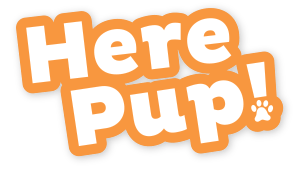 Best Dog Food for Hunting Dogs: Reviews & Top Picks! 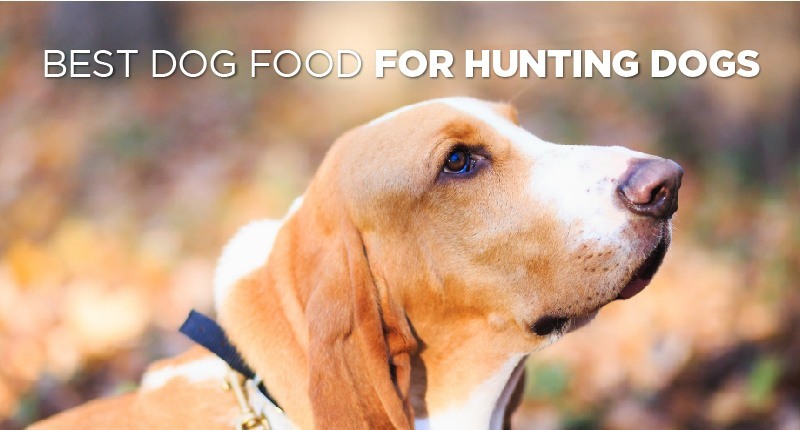 When you’re working with hunting dog﻿s who need to perform at high-energy levels throughout the day, you will want to feed them high-performance dog food. If you don’t take the time to find the best dog food for working dogs like yours, you may be risking injury or poor health for your dog. The best are those that digest slowly while providing essential nutrients. These will keep the dog energized and will give their muscles all they need. The best hunting dog food will have a blend of fat, protein, and carbohydrates perfect for your dog. There is no perfect ratio, but foods that can be recommended as the best gun dog food will have at least 20% fat and 30% protein if they are working for many hours a day. If they’re only working for one or two hours, you could go with lower percentages. The best working dog foods for most dogs will have at least 30% protein, no more than 50% carbohydrates, and good sources of fat. 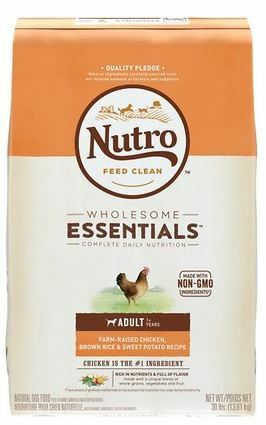 The food I want to most recommend for hunting dog owners today is this high-protein, grain-free food. 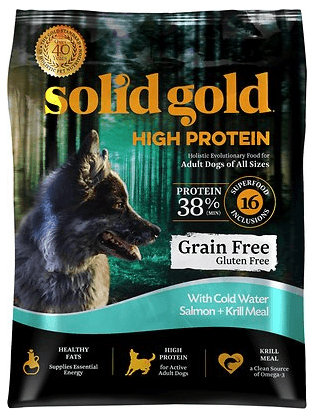 While it is expensive, it is a great quality food that has excellent fat and protein levels for your active working dog. The first five ingredients in this food are salmon, ocean fish meal, peas, pea protein, and chicken fat. This means that the majority of the protein comes from real fish meat sources, and the fat comes from the named source chicken fat. The reliability that comes from a Solid Gold food is amazing. The reason I like this food so much is because of how low carb it is, and that those carbs come from non-grain sources. This means that your dog will be digesting food easier and getting more out of it, both essentials for a true working dog! This next food has the idea 30/20 protein-to-fat split that is recommended as a base level for performance animals such as hunting dogs. The combination assures good energy levels while also allowing for a lot of energy. The main source of protein in this food is chicken meal, with real chicken being an ingredient a bit lower on the list. The single main protein source is the reason this food is so much cheaper than some others with two or three real sources of meat protein. Other healthy ingredients include whole grain oatmeal, whole brown rice, and chicken fat. Fatty acids and chelated minerals are also included in the formula. Orijen is a very expensive food, but the cost is high because the quality is high, too. This food features a 38/18 set of percentages for protein and fat, which are much higher than some other foods. This food is good for dogs that are true working dogs and need all the energy they can get. This is a “whole prey” food which means the protein is split between meat, edible bone, and animal organs. The first fifteen ingredients in this formula are meat proteins, with the exception of whole eggs. Fish, deboned poultry, and more items are all clearly identified. 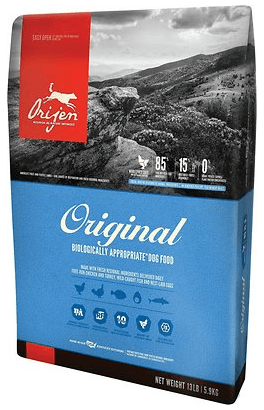 With Orijen food, you are getting high-quality, non-filler sources of protein that your dog will thank you for. These sources of protein are incredibly healthy for your dog and worth every penny if you can fit it into your budget. This is one of the more affordable, high-protein dog foods on the market. 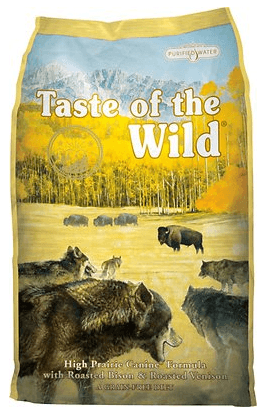 Taste of the Wild has long been a popular food with hunting and working dog owners, and it is because they have built their brand on quality ingredients that provide good sources of fat and protein. The first four ingredients in this blend are buffalo, lamb meal, chicken meal, and sweet potatoes. That gives your dog three great sources of protein and a good source of non-grain carbohydrates. Highly digestible energy and a healthy digestive system for your dog can be achieved if you feed them Taste of Wild. If you’re looking for a different protein source or amount of protein, try one of their other blends. 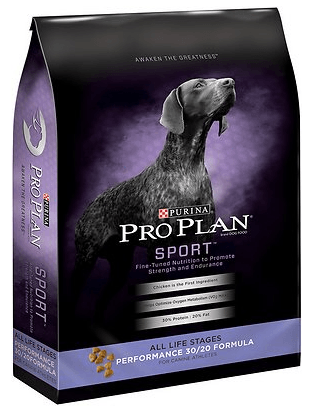 The last food on my review list today is the most affordable of the bunch, and it still manages to come in at the 30/20 protein to fat percentages recommended as a minimum for dogs that will be working hard all day. This food from Purina features chicken as the main source of protein and animal fat as the main source of fat. I would highly prefer if this food did not contain corn gluten meal and if it named the animal fat source more clearly, but when you’re looking for a more budget-friendly food, it gets harder to find a food with absolutely no corn, soy, or grain. I still recommend this food for active dogs with strong stomachs that can process some of the more difficult ingredients. If dealing with a sensitive stomach, try to spend a bit more for something with less processed ingredients. I hope my reviews of some of the best working dog food choices has helped you to discover what your dog needs. If your dog is only actively working for many hours a day during a few weeks or months of the year, you may want to find two different foods. One, with higher protein and fat levels, can be used during the active season. The other can be used the rest of the year. Regardless of what you choose, I would recommend any of these dog foods as some of the best hunting dog food. Your dog will be energetic, focused, and on alert all day long with any of these foods in their system. Best Dog Food For Kidney Disease: Reviews & Top Picks! 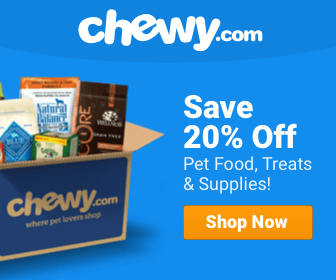 Best Dog Food For Bad Breath: Reviews & Top Picks!